Arvind Kejriwal is demanding action against IAS officers who boycotted work and approval for the proposal for doorstep delivery of rations. Delhi Chief Minister Arvind Kejriwal's sit-in protest at Lieutenant Governor Anil Baijal's house stretched late into evening on Monday. 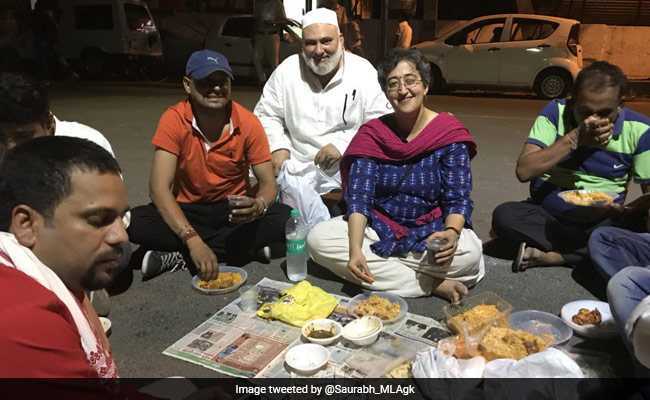 Tweets showed the Chief Minister, his deputy Manish Sisodia and others stretched out of sofas in Mr Baijal's waiting room as party leaders and supporters camped outside. Mr Kejriwal has promised not to leave till Mr Baijal accepts his wishlist -- approval for the proposal for doorstep delivery of rations, and action on IAS officers who, he says, have been boycotting work for the last four months. A communique from the office of Mr Baijal, who met the delegation early in the evening, accused the Chief Minister of "threatening" him. Denying any strike or suspension of work by IAS officers, the Lieutenant Governor's office has pointed to the "atmosphere of mistrust and fear" that continues since the alleged attack on Delhi's chief secretary in February. The impression from interaction with the officers is that "no sincere efforts have been made to assure the officers that their respect and dignity will be protected and they will not be intimidated, physically or verbally assaulted and threatened," the Lieutenant Governor said. His advice to build an atmosphere of trust has been disregarded, the communique said. Mr Kejriwal and his deputy Manish Sisodia tweeted their response. Press release issued by Hon @LtGovDelhi is clear evidence that he is the mastermind behind the IAS officer strike in Delhi for last 3 months, which has never happened in independent India. Mr Kejriwal and his party, which accuses the Governor of being the Centre's agent, has started a campaign for full statehood for Delhi -- its big slogan "L-G, Delhi Chhodo (Lieutenant Governor, Quit Delhi)". The Centre claims since because Delhi is not a state, the Lieutenant Governor has special powers and has to sign off on the government's decisions. Mr Kejriwal and his party contends that it allows the Narendra Modi government to interfere in the governance of Delhi. One of AAP government's big run-ins with the Lieutenant Governor took place last month, when Mr Kejriwal went to meet Mr Baijal to discuss the row over installation of closed-circuit television cameras in Delhi. The Lieutenant Governor, who had agreed to meet only Mr Kejriwal and his deputy, refused to meet the full delegation. Mr Kejriwal then sat on a 'dharna' near the LG's office with his party leaders and cabinet colleagues. It was his first street protest after returning to power in February 2015. Mr Kejriwal claims the IAS officers of Delhi have been on an "illegal strike" for the last four months. "As per law, the IAS cannot go on strike. There is no reason for the strike, they don't have any demand," news agency IANS has quoted him as saying. He also said the officials have told him that they have been under "pressure from the LG's office" not to work. The Chief Minister also said in March that the Lieutenant Governor has turned down the government's proposal to provide weekly rations to beneficiaries under the Public Distribution System.